During the summer of 2010, my family and I brought several students along during our annual trip to Wudang Mountain. Bringing students to the mountain is one way to pay our respect to the origin of the Wudang arts. During the summer of 2010, my family and I brought several students along during our annual trip to Wudang Mountain. Bringing students to the mountain is one way to pay our respect to the origin of the Wudang arts. Over the course of our trip, the students were able to participate in many aspects of Wudang life that normally is closed to outsiders. We ate in the temple kitchens every day, participated in Daoist ritual, and had classes and practice sessions with many respected teachers. By participating this way, Wudang Mountain can ensure that the Daoist arts are being protected and accurately passed on. We are in a position where we are able to act as a bridge between two cultures (Western and Wudang Daoist). We hope that those crossing the bridge will create friendship and mutual understanding. My teacher, Li Guang Fu, has asked me to share the Wudang arts in the West. Bringing students back to visit the mountain is one way to help them practice. Experiencing China and traditional Chinese culture is important for students of all martial arts. Li Guang Fu is the abbot of Wudang Mountain and the head of the Wudang Daoist Association (the group of Daoists on the mountain). Master Li is the highest ranking Daoist on the mountain, and has been the abbot since 2003. Wudang Mountain is not just one mountain; it's a range that covers a large area of land. To drive from the bottom to the top, it is over an hour, and cars can't go all the way to the top. In the winter there are some days when the mountain is closed due to snow, but usually the roads are passable. There is a very diverse group of people on the mountain. In addition to the temples and martial arts schools, there are hotels, tour buses, government offices, and restaurants and shops for tourists and pilgrims. There are around 300 Wudang Daoists in four major temples and several smaller temples. The Daoist lifestyle incorporates study of classical Daoist philosophy, ritual practices, meditation, and physical exercises. For those who live at Wudang year-round, training on the mountain is a full time endeavor. In the West, due to the high cost of living, it is extremely rare for people to leave their jobs and devote themselves entirely to their practice. The 15 schools on Wudang Mountain are very diverse. Some are run by the practice brothers who I grew up with on the mountain; some by graduates of the government's sports academies, and even some schools run by people from Shaolin Temple. Since the schools are so diverse, some teach the traditional forms and others the more modern performance oriented versions. This is why, when Dr. Yang and I first talked about filming the Wudang arts in DVD form, I asked if he was interested in the performance forms, or the traditional forms. Fortunately for me, he shares my love and respect for the traditional styles. I devoted several years to studying full time as a novice in a temple, thus completing the more traditional process to ordination as a Daoist monk, or priest. The differentiation between being a monk or a priest is a Western concept. It doesn't exist in the Chinese language. In Chinese, all male Daoists are called 道士 (dao shi), and all female Daoists are 道姑 (dao gu). There are two major schools of Daoism in China today. There is正一 (Orthodox Unity) Daoism and (Complete Reality) Daoism全真. 正一 (Orthodox Unity) Daoism The school of Daoism that was first practiced at Wudang Mountain, Orthodox Unity Daoism, was founded in 142 C.E. during the Eastern Han Dynasty. Many of the original Orthodox Unity Daoist practices grew from shamanistic origins, including writing talismans for protection, and using natural herbs and minerals to create health potions. Orthodox Unity Daoists can choose to live in temples, or offer their services while living among the people. Many Orthodox Unity Daoists practice martial arts or medicine. (Complete Reality) Daoism全真. Hundreds of years after the Orthodox Unity School was founded, during the Song Dynasty (960-1279), Daoist religion, Buddhism, and local folk practices began to mix, and the Complete Perfection school of Daoism (Quanzhen Dao) emerged. Complete Perfection Daoism is the major monastic form of Daoism today. Complete Perfection Daoists are traditionally celibate, live exclusively in monasteries, and practice “internal alchemy.” which seeks to refine the body through breathing exercises, meditation, and visualization practices. However, in modern times, differences between the two schools are less obvious, and many Daoists adopt practices from both lineages. For example, I studied with masters from both lineages, and I was inducted into both the Orthodox Unity and the Dragon Gate lineage (which is a Complete Reality sect). In the West, sometimes Complete Reality Daoists are referred to as Daoist Monks, and Orthodox Unity Daoists are referred to as Daoist Priests, but again, the difference does not exist in the Chinese language. Nor have I seen the "priestess" vs. "nun" distinction ever used to differentiate female Daoist initiates from the two lineages. There are more similarities than differences between the different schools of Daoism, and all Daoists embrace the three jewels of the Dao: compassion, moderation, and humility. All of the Daoist arts are wellness arts. The first question Daoists ask themselves about their habits is, "Is this healthy for me?" which I think is a question that all of us, in our modern society, could be asking more frequently. Many of the basic philosophical concepts behind these arts, the taiji (yin-yang), five elements, and other Daoist beliefs, can be applied to martial arts, medicine, diet, interpersonal relations, and much more. Many of the modern arts are very superficial. The traditional arts are very deep, the more you practice, the more the art has to offer. Within the traditional martial arts is a soul that transcends the realm of fighting and self-defense and can be any part of your life. To preserve the Wudang arts means not just learning the movements of the forms, but also understanding the theory and philosophy behind the movements. So, an element of study is also required. We also should try to record the arts as technology evolves, so that there is a reference that later generations of students can refer back to. It is also important to remember that the arts are living arts, not something fixed, like a painting. Even those who master the Wudang arts, all master them differently. For the Wudang arts, a way to check for accuracy is to constantly ask yourself if your practice manifests the underlying principles. The underlying principle is the Dao--compassion moderation, and humility. A diverse group of students joined us on the trip, including men and women, ranging in ages 3 to 60+. Some were my regular Boston students, others were students we met at special events or in China, and others were friends we had met online. When we got to the mountain we went directly to the Purple Heaven Palace (紫霄宫) to pay our respects to Master Li Guang Fu (李光富). Purple Heaven Palace is the home of the Wudang Daoist Association (武当道教协会) and is considered by many to be the spiritual heart of the mountain. After two weeks to adjust ourselves to the mountain, we made the hike up to the Golden Pinnacle (金顶) which is the temple on the very top of the mountain. Although not present in ancient times, most modern pilgrims take the cable car. This year the cable car is being replaced, and was out of service, so we had a gorgeous three hour hike up, and were able to pay homage by ascending the mountain in the traditional way, with sweat and blisters. The top of the mountain is a magical place. 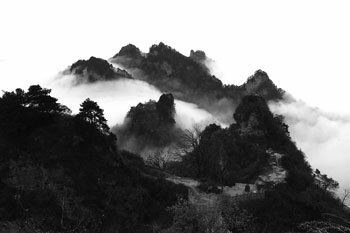 Literally nestled among the clouds, the temples appear and disappear as the weather shifts. We spent three days on the top of the mountain. One of the high points of this time was a lecture with Master Lu (卢道长) the abbot of Golden Pinnacle, who charmed the group with his impressive English and joyful heart. After returning back down the mountain to Purple Heaven Palace, one of the most exciting events of our trip took place. Two students, Michael Vollero and Scott Mayer completed the 拜师 discipleship ritual, formally initiating them into the Wudang Daoist lineage. The ritual was a two-hour event involving chanting, and ritual offerings of incense. Both of the new disciples bowed to show their respect for the lineage, were given Daoist names, and their names were entered in the registry (list of Wudang Daoists). Believe it or not, the traditional initiation ritual is not often performed at Wudang Mountain. For many years, the Daoist masters have only accepted their students as disciples, allowing them into the lineage, in small private ceremonies. According to Master Li, who officiated the ritual, this was the first time the traditional initiation ritual had been held for almost 10 years, and the first time it had ever been done to initiate foreign disciples. Not only did this ritual involve an exciting step for Wudang Mountain, welcoming foreign disciples, it also involved a return to tradition, reviving the ancient ceremony. We were honored to be a part of this process. Shortly after the ceremony we moved our regular classes to the Daoist Studies Institute (道教学院) two hours away. The Daoist Studies Institute is a temple and a university all rolled into one. 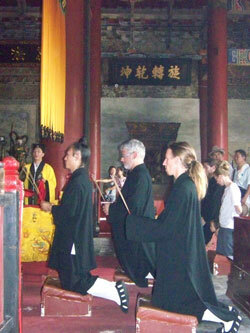 The Institute offers a three-year program in Daoist history, ritual, chanting, meditation, philosophy, and English. The group enjoyed a lecture on Wudang Daoist history with Professor Yang Li Zhi (杨立志教授) the chair of the Wudang Daoist Culture Historical Society, and a lecture and practice session on Qigong and Daoist Meditation with Master Wang (王道长) the Institute's meditation professor. After visiting the Daoist Studies Institute, the group headed home to the United States. After returning, one participant wrote to us sharing feelings that seem to sum up the group's experiences, "the opportunity to visit Wudang with an "insider" is unlike anything someone could achieve by traveling on their own. The sheer vastness of these sacred mountains is overwhelming, but Zhou, Xuan-Yun's presence, personal connections, and knowledge made this pilgrimage one of the most fulfilling experiences in my entire life." We all returned from the mountain inspired, and with our batteries fully charged for the road ahead. We have already begun planning the trip for next year. Here are some more photos from the trip.